Leaderboard tracks the fastest times from the QUALIFYING round and determines the competitors that make it to FINALS. 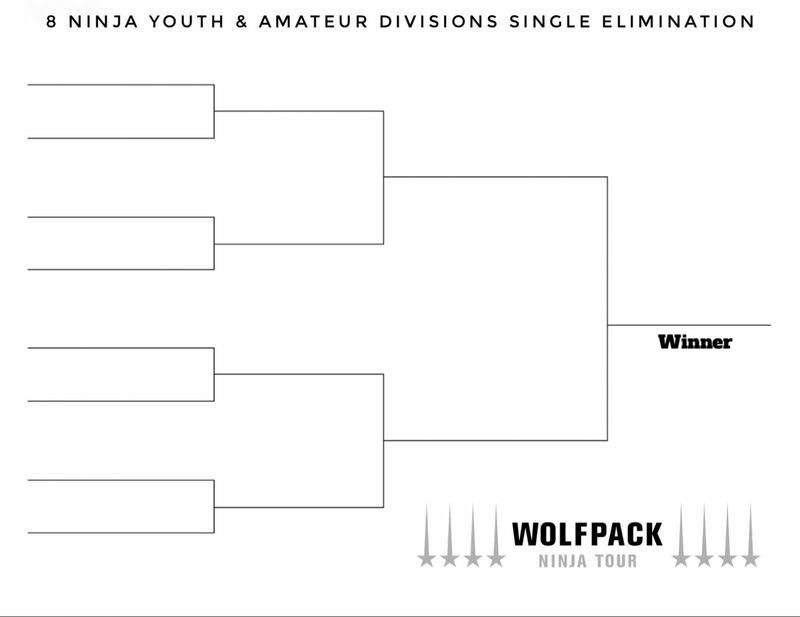 The PRO men’s & women’s FINALS will have a 16 Ninja Double Elimination Bracket while the remaining divisions will compete in 8 competitor SINGLE ELIMINATION Brackets on Finals Night. Purchase a WOLF PASS which skips pre-qualifying and allows one (1) attempt at the Pro Course to make the LEADERBOARD and qualify. All competitors are allowed a maximum of three (3) attempts at the Pro Course to improve their time and ranking on the LEADERBOARD. Be part of the Wolfpack Ninja Tour Pro Team. 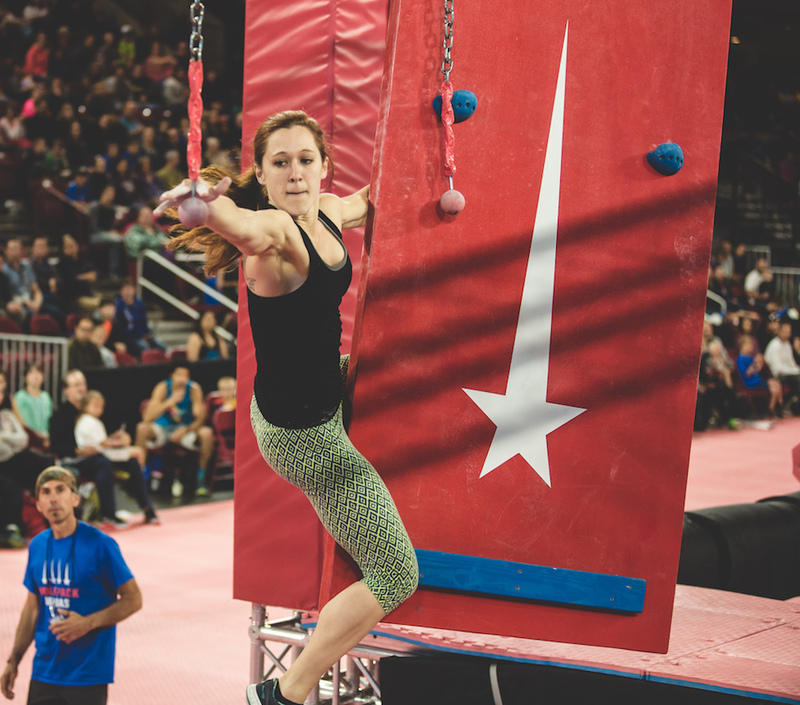 In the QUALIFICATION round, competitors will try to complete the Pro Course in the fastest time possible. The LEADERBOARD will track the top times for each category. A WOLF PASS COIN must be submitted for each run and is valid for only one run. As described above, a WOLF PASS COIN can be obtained by buying a WOLF PASS or a VIP ticket or by invite. Competitors may purchase up to two (4) additional WOLF PASS COINS for two (4) more chances at improving their position on the LEADERBOARD. 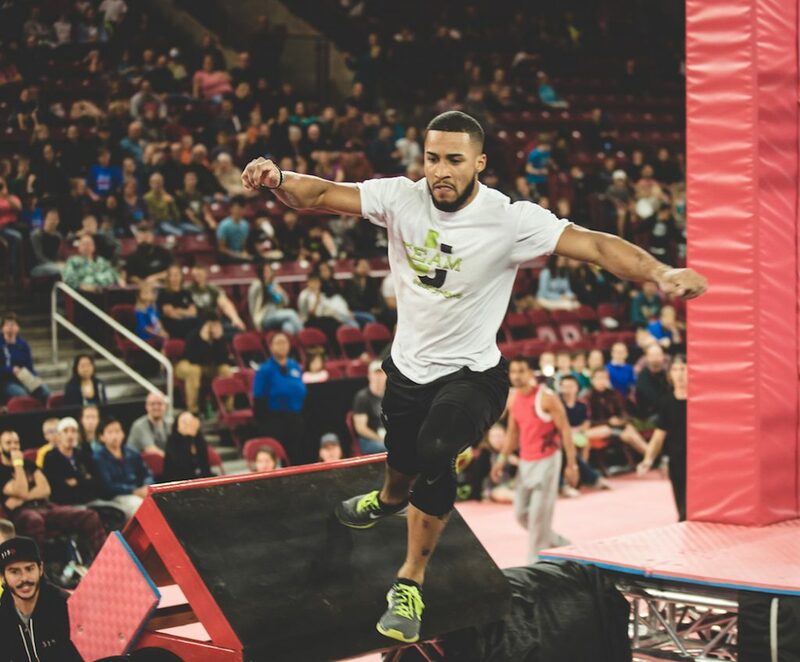 Athletes will qualify for FINALS if they are at the top of their division (top 16 for PRO men’s & women’s, top 8 otherwise) at the end of the QUALIFICATION round. A couple ninjas who just missed qualifying for FINALS may be asked to stay for FINALS as alternates in case there is an injury or a no-show. If alternates are needed, they will be chosen based on their ranking in the QUALIFICATION round. In the case of a tie that spans the boundary of who qualifies for finals (e.g., tie for 16th place), tied competitors will race head-to-head in a mini tournament bracket to determine who gets the last qualification spot(s). These tie-breaker races will be held right before the FINALS round and will be subject to the same rules as FINALS. 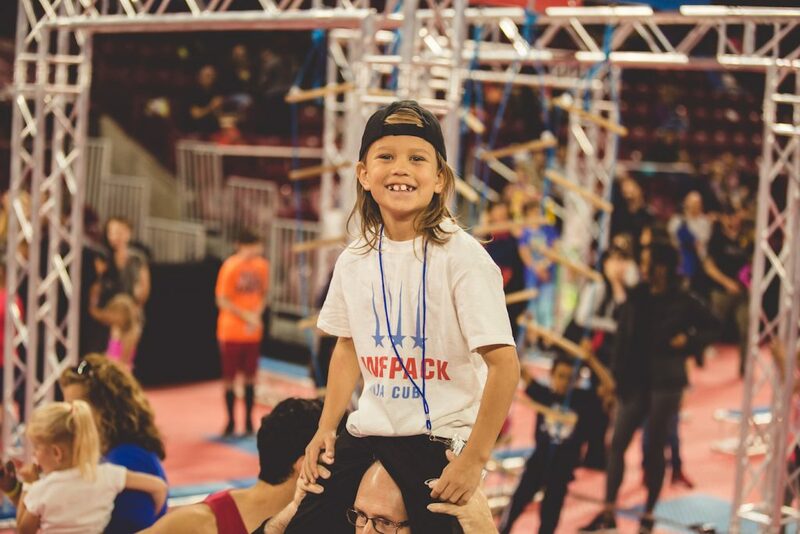 Unlike the QUALIFICATION round where ninjas race against the clock, in the FINALS round, ninjas will race head-to-head against each other on the Pro Course in a DOUBLE ELIMINATION tournament format. The winner of each head-to-head race will continue on to the next race in their bracket. Competitors that lose a race will have a chance to come back in the loser’s bracket. Competitors that qualify for FINALS are responsible for showing up at the posted time. If you are a Finalist click HERE for instructions about showing up for FINALS. Competitors who are late will be disqualified and alternates will take their place. The race begins with an electronic starting sound. If there is a false start, competitors will be stopped immediately and the race will be restarted. The first ninja to hit the ending buzzer wins the race. In the event that both Ninjas fall, the Ninja that goes the farthest in the shortest amount of time wins. “Farthest” on the course is measured per obstacle (not within obstacle). If a competitor completes an obstacle that their opponent falls on, then that competitor wins. 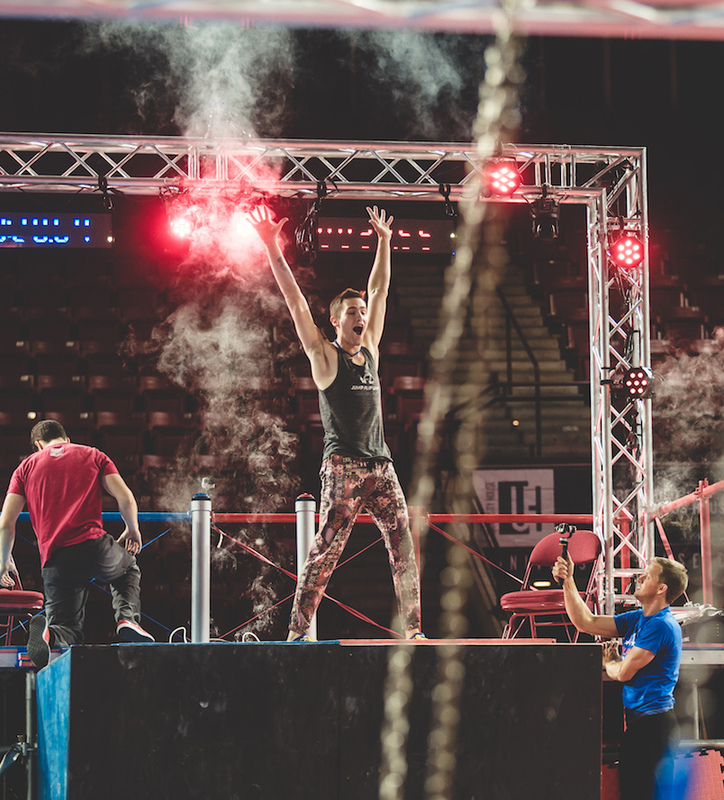 If both competitors fall on the same obstacle, the winner is the competitor who first arrived at the preceding platform (i.e., who finished the previous obstacle first). 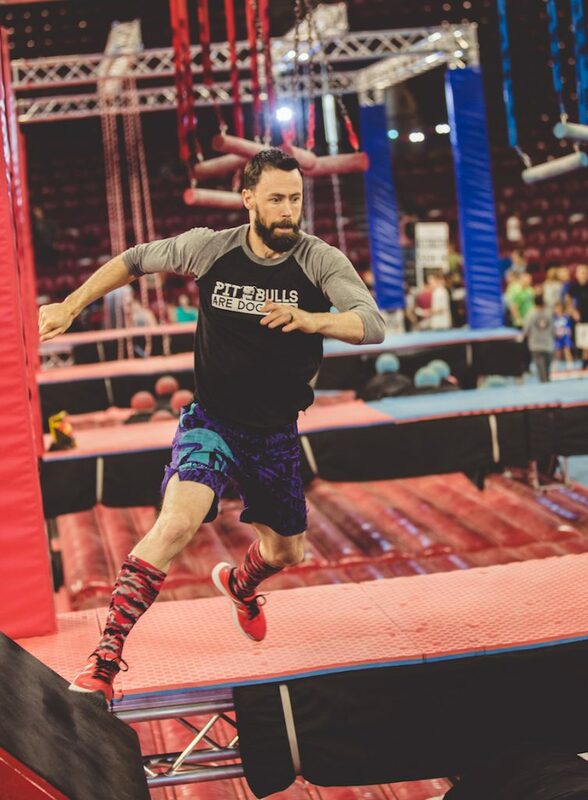 If both competitors fall at the same place and it is too difficult to judge who finished the previous obstacle first, the race will be re-run. If a ninja is disqualified by a judge for purposely using truss or other various reasons, the other Ninja wins the heat. If a ninja is injured and cannot compete, the other Ninja in the bracket will receive a bye and win by default. The head judge will make all final decisions pertaining to the race. The Finals Heats are timed for tie-breakers & record keeping sake, standings and for competitor strategy. In the case of a course malfunction or other circumstances that affected a race, a competitor make an appeal to the head judge. Any rerun will be at the sole discretion of the head judge. Appeals must be immediately after the run in question (no more than 5 minutes may elapse between the end of the race and the appeal). Competitors may not change lanes during the race. Some obstacles may have shared elements and the competitors can use those in any way. However, at the end of the obstacle the competitor must move back into their own lane. Competitor must press the finishing button in their lane. Incidental contact with your opponent is allowed during the race. However, any intentional contact or attempts to disrupt your opponents run will be cause for disqualification at the discretion of the head judge. Incidental contact with the padding and truss is allowed and subject to the Line Judge’s determination. LANE CHOICE is computer generated. Loser bracket competitors MAY RACE MORE TIMES. This is the nature of double elimination brackets. For instance, a competitor in the loser’s bracket may race 7 times to come all the way back and face a winner’s bracket competitor who has only raced 5 times, etc. Races will be run in an order that gives resting advantage to the winner’s bracket competitor if there is one race or less in between matches. Any competitor may have to race back to back and this is a part of the competition. The event organizers may at their discretion pause the event to allow competitors rest for safety and fairness of the competition. If a competitor is injured, they may decide if they want to try to run their next match only with approval from the event organizers. In the case of a forfeit due to injury or disqualification, the opponent will receive a bye. TIES are resolved in the Finals bracket by the competitor with the fastest time during Finals. If competitors failed to finish the course and establish a time in Finals then their opponent will win the tie if they did finish the course and obtain a time. If a competitor falls, their opponent may elect to finish their race to obtain a faster time. The FINALS competition is a double-elimination format that allows ninjas to come back from a loss. Ninjas will be placed in the tournament bracket according to their finishing place in the QUALIFICATION round. This seeding gives an advantage to top placing finishers in the QUALIFICATION round. Finishing place will be determined based upon the ninja’s performance in both the winner’s bracket and the loser’s bracket. It is possible to work your way through the loser’s bracket and still win the event. Similarly, it is possible to lose in the first round and still come back to a top 4 finishing place. Note that winning in the first round does not guarantee a top 8 finish. The competition will be run through the Challonge web interface (www.challonge.com) and the placing for the tournament bracket will be determined by the website software. The method for determining places is a bit complex, but roughly reflects how many rounds into the tournament you make it (in either bracket) and gives a slight preference to people that go farther in the winner’s bracket. The top 4 places are always resolved via the tournament, but there are generally ties in the places higher than this. Placing within groups of tied ninjas will be determined by comparing each ninjas fastest clocked course time during the FINALS round. The faster ninjas will receive a better placing. In the event of a tie in final place in the bracket AND fastest clocked time during finals, the results from the qualification round will be used to determine placing. The use of times to break ties will not be reflected in the Challonge software but will be calculated by the tour staff. Prize money will be allocated to the top athletes according to their finishing place as determined by the rules described above. If you are interested in understanding the format better, visit www.challonge.com and run through some sample brackets. The order of the races in the tournament is known at the start of the event and will be displayed on the full bracket. Note that this order may be different than the ordering shown in the sample bracket below. Additionally, the head judge may switch the order of an race for any reason (though all attempts will be made to follow the prescribed order). Race 27 & 28 will be switched so that the Winner’s Bracket will have the rest advantage. 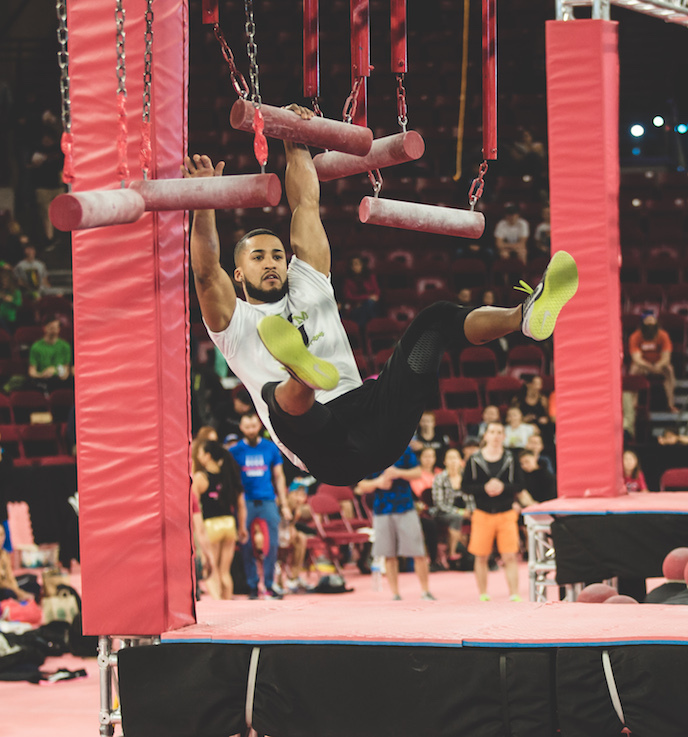 Truss is used in a non-incidental way and the Judge calls the competitor out. Any aid device, chalk, resin etc. that is not specifically provided by the WPNT is used for a competitor’s advantage. Performance enhancing drugs are used. If a competitor is injured and cannot continue. If a competitor does not appear at the appointed time for the competition. If the WPNT event organizers or Head Judge decides to disqualify a competitor for another reason not stated above. The top sixteen (16) Pros from the Leaderboard in the Mens’ & Womens’ divisions will compete during the Finals Spectator Event. This is the sport of a new generation. There will then be an awards ceremony. The top eight (8) Ninjas from the Leaderboard in these divisions will compete before the Finals Event at a separately scheduled date/time. This is a time based competition. Competitors will be racing up a rope one at a time to post times on a leaderboard. The 2 fastest Men’s and 2 Fastest Women’s times at the end of the event and before Finals will qualify to race during Finals Night on Sunday. During the Finals event, the 2 finalists will compete head to head for the prizes. It is the responsibility of the athlete to be present at time of award (at the Awards Ceremony immediately following the Finals Event.) The Prize is $150 for 1st Place Men’s & Women and $50 for 2nd place plus awesome SWAG. This is a Total Repetition based competition. Competitors will be doing MAX pull-ups with results posted on a leaderboard. The most pull-ups at the end of the competition day and before the Pro competition starts wins. Pull-ups must be good form and all the way down and up. No kipping. A station judge will notify competitors of form and only count best-form pull-ups. A leaderboard will be updated online. Competitors are responsible for knowing what place they are in. It is the responsibility of the athlete to be present at time of award (at the Awards Ceremony immediately following the Finals Event.) The Prize is $400 for 1st Place and awesome SWAG for 2nd and 3rd place. This is a time based competition. Competitors will be holding a handstand for times posted on a leaderboard. The longest held time at the end of the competition day and before the Pro competition starts wins. “Walking” is not allowed more than 2 hand “steps.” The winner will be decided by the timer and a leaderboard will be updated online. Competitors are responsible for knowing what place they are in. It is the responsibility of the athlete to be present at time of award (at the Awards Ceremony immediately following the Finals Event.) The Prize is $400 for 1st Place and awesome SWAG for 2nd and 3rd place. This is a speed based competition. Competitors will be racing on the pro course and must have a WOLF PASS to enter times on a leaderboard. The fastest time at the end of the competition day and before the Pro competition starts wins. COMPETITORS OVER 40 MAY ENTER THIS COMPETITION AND A DIVISION AS WELL. The winner will be decided by the time the competitor achieves and a leaderboard will be updated online. As with the normal competition, a competitor may only try for the fastest time a maximum of 3 attempts (3 WOLF PASSES) Competitors are responsible for knowing what place they are in. It is the responsibility of the athlete to be present at time of award (at the Awards Ceremony immediately following the Finals Event.) The Prize is $400 for 1st Place and awesome SWAG for 2nd and 3rd place. Competitors will accrue tour points based on their final ranking at each event. The final ranking is determined by the Qualification round for places 17 and higher and by the Finals round for the top 16. Tour points are structured such that those who qualify in the top 20 get an extra points boost with the top finalists geting the most boost (i.e., the point differential between places grows as you get closer to the top places). 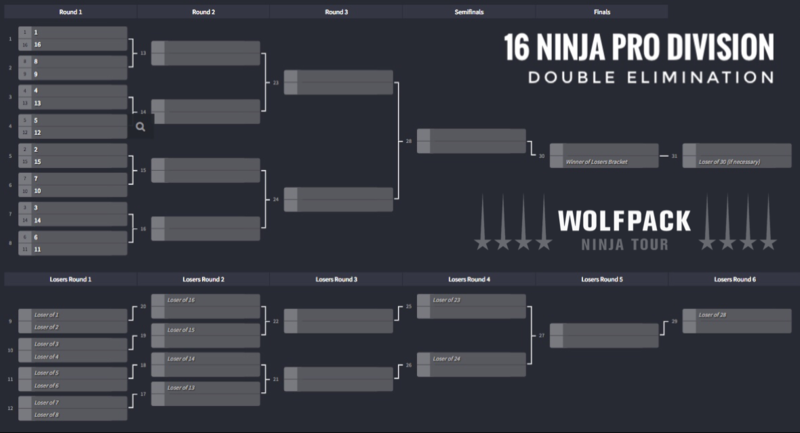 The top 99 competitors in each event will earn Wolfpack Ninja Tour points that will give them a spot on the overall Tour Leaderboard.